The Carlsbad Flower Fields are what technicolor dreams are made of. Every spring, this 50-acre field of nothing but blossoms is covered in red, orange, yellow, green, and purple flowers. Surprisingly, the folks here didn't set out to plant a botanical garden. Instead, they are a commercial grower of Giant Ranunculus bulbs. It just happens that the flowers these bulbs produce are so beautiful, that people want to see them. They're so popular that they create a temporary tourist attraction every spring. Whether you're driving to San Diego or just want to check these fields off of your bucket list, they certainly make for one of the most beautiful and unexpected stops in Southern California. Find out what else you can do around San Diego with my guide to things to do in San Diego. What Is There to See at the Carlsbad Flower Fields? The main attraction at the Carlsbad Flower Fields are, you guessed it, the flowers. The Giant Ranunculus flowers they grow to be exact. Ranunculus are dense-petaled flowers with vibrant colors that look like a box of crayons. The flowers in Carlsbad are exceptionally fluffy and are bred by Edwin Frazee to make them that way. If you're a fan of other kinds of flowers, the Carlsbad Flower Fields still deliver. Besides the blossom show, there's a miniature rose garden, a poinsettia greenhouse, a sweet pea maze, and a display that includes each of the more than 180 All-American Rose selection winners since 1940. For an extra fee, you can take a wagon ride around the fields or mine for gems in a simulated gold-panning setup. With so much to do, these fields are the perfect destination for friends and families alike. A Carlsbad Flower Fields wedding is popular among couples as well. If you love colorful flowers, this place is for you. You can walk among them and enjoy the masses of color. Photographers like the flower fields and they appear in more selfies than you can count. Visitors can buy Flower Fields brand products at the store located at the site. Because the Carlsbad Flower Fields are mostly intended for growing bulbs, they sell only one to two percent of the flowers. That still amounts to almost a million flower stems, which is a small number compared to the six to eight million bulbs they harvest each year. You can find more opinions about the Flower Fields at Yelp. Or see what people have to say about them on Tripadvisor. The display peaks about three weeks after they open the fields to the public. Know what to expect: They're pretty, but not as thick as many photographs may lead you to believe. Allow an hour or two for your visit. The flowers like the sun, but you may not. Bring a hat, sunscreen, and water. Leave the pets at home. Only certified support animals are allowed. Weekdays are less crowded than weekends. Try not to be one of "those" thoughtless visitors who step all over everyone else, photo-bomb everyone else's shots and generally ruin things for everyone else. If someone else is doing that to you, a simple "excuse me" might do the trick. In a busy situation, don't try to time it. Instead, use your camera's burst mode to take several photos in a row. Then delete all but the best. There's nothing else to see but flowers and more flowers, and while that is beautiful to some, there isn't much else to do nearby if you're trying to plan a full day. The fields are open daily when flowers are in bloom, early March through early May. For exact dates, check their website. They charge an admission fee, but parking is free. 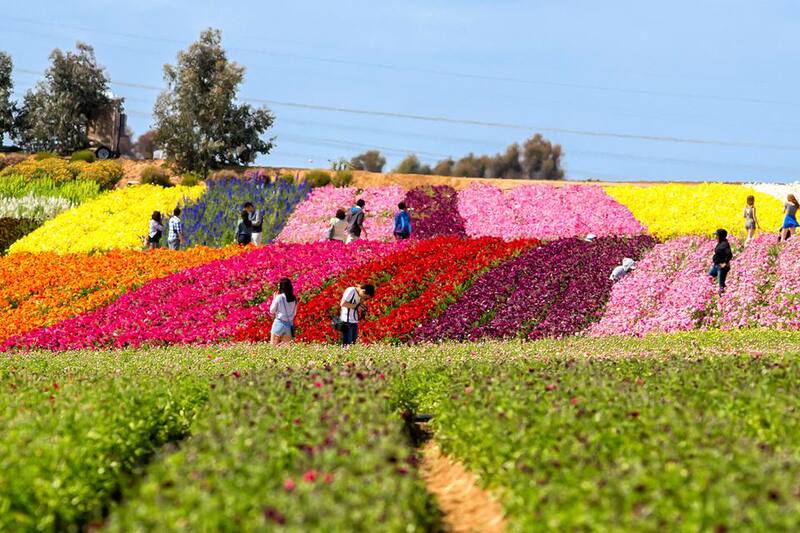 The Carlsbad Flower Fields are located in north San Diego County, just off Interstate Highway-5. You can get driving directions at their website.